No one is going to mistake Rillito Park for Saratoga but they both have something in common. Actually two things, one they both are protected historic sites, the other, Bob Baffert saddled winners at both tracks. Rillito Park actually started out in 1943 along the banks of the Rillito River. It was the first sanctioned quarter horse racetrack in the United States. Back then the track itself and it's surroundings are nothing like today. The track itself was just a straightaway and the location a little more isolated. In the fifties an oval was added to accommodate thoroughbred racing. 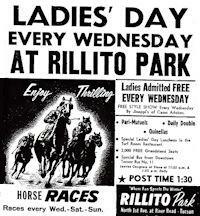 Rillito was not without it's problems, by the seventies times were tough and the track closed down. In 1984 the voters of Tuscon voted that Rillito would remain a racetrack no matter what. In 1988 new owners gave it a go and failed, but persistence paid off and Rillito runs on. With it's unique grandstand, short season and rich history this is definitely a bucket list track. In 2011 Rillito ran it's normal January, February weekend schedule. Floyd Campbell was the leading rider. Rillito does not have a published Purse Value Index, no surprise there. Racing is again on tap in 2012. The 2012 short Rillito meet ended on March 25th after running sixteen days over eight weekends. Carl Williams was the leading rider for the season.